Horizons uses low and high ropes course elements to help groups transform themselves into effective teams. 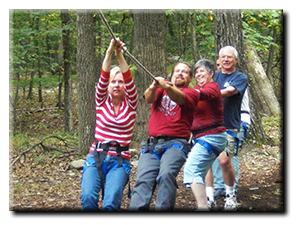 The ropes course challenge experience is unique in that it creates special bonds within the group and underlines each individual's strengths and areas of improvement. The MBTI is a popular measure of personality traits and individual preferences. 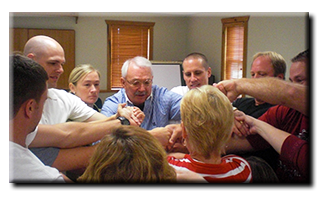 MBTI programs are designed to help participants understand their own work styles as well as those of their co-workers and customers/clients. An understanding of preferences and work styles enables participants to improve communication, resolve conflicts, and increase productivity. In an age of increasing local and global competition, the ability for an organization to build a corporate culture that attracts and retains talented people is rapidly emerging as the most important criterion for financial success. It is a new technology for high-functioning executives, teams and organizations and a powerful new tool that facilitates organizational change in the corporate arena. Its nine personality types provide business leaders with insight into their own personal beliefs, habits of attention, blind spots and resistance to change. The Enneagram brings home the validity and value of other, often misunderstood points of view of colleagues, clients and employees. The insights are essential in developing the greater personal flexibility needed to succeed in today's changing corporate environment. This is a systematic approach to engage professionals with their challenges and support their moving forward towards goals and objectives. Coaching both teams and individuals usually begins with the development of a new team or when an individual or team is stuck or stymied.